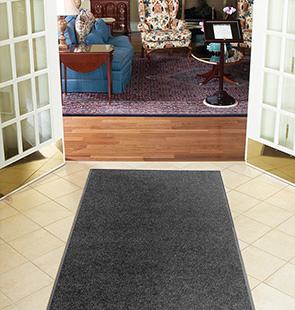 Polynib™ has the rich, luxurious look of Berber-style carpeting for an always elegant appearance. A very tightly nibbed loop of needle-punched yarn entraps and hides debris while retaining moisture at the same time. 24 ounces of carpet per square yard provides greater crush resistance for long lasting wear. Polynib™ comes with a heavy-weight vinyl backing in corresponding colors to help reduce mat movement and enhance the aesthetic appeal of the mat. Custom lengths available in 2', 3', 4' and 6' widths, up to 60' lengths. A very tightly nibbed loop that entraps debris and hides it for an always elegant appearance. Vinyl backing in corresponding colors helps reduce mat movement.